I've had this picture for quite some time now. I ran across it when dad asked me to get rid of a ton of old records from his office. I found some cool stuff that he let me keep. 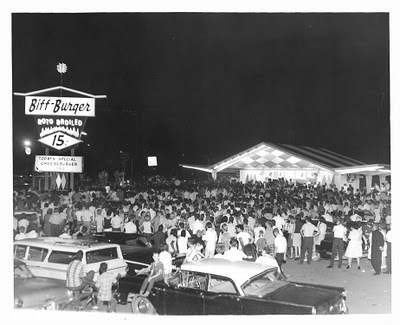 This image is the grand opening of Biff-Burger that was located at edge of Agricola Shopping Center parking lot at the foot of Noccalula Mountain. The Gadsden Cinema was later built behind it. This picture has always made me chuckle when I see it. I mean - look at all the people that showed up for the first night of business. Biff-Burger must have made a killing on fifteen cent cheeseburgers that night! I didn't eat there much growing up. The last time I went was with Dan Noojin. His dad wanted a milk shake from there and we all drove down together. That was at least 25 years ago. If memory serves, the place was leveled by the end of eighties. Gadsden used to have a bunch of burger joints back in the 60's. The big hang out when my older brother and sister were in high school was Burger Chef on Meighan Blvd. I remember eating there a good bit. I also remember Pick-A-Burger. The Big Cheif is still open in Glencoe. Majik Burger in Attalla is still going strong. Wayne's Burgers didn't come around until the early eighties but it's still in Alabama City. Gina doesn't like going to these places for some reason. I like to go to them because they usually serve better tasting food than the big franchises. I've got an idea...How about packing your family in the car one night during Spring Break and hit a mom and pop burger joint? I think I'm going to take my girls to Majik Burger for an ice cream. Sounds like fun huh? Well what do you know, Biff-Burger was a franchise!